The process begins with me writing a poem. 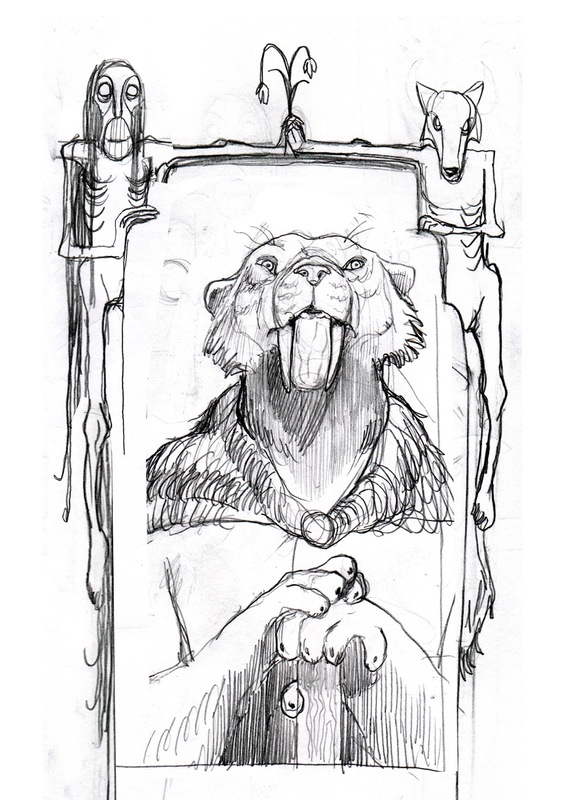 Usually the character(s) involved will be a beast of some type, but not always (see Hrafna, for example). 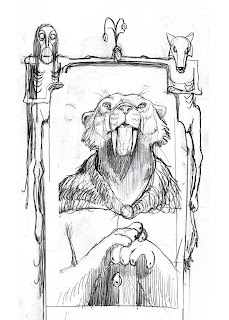 In my visualising of the beastly characters that I create, I've been inspired by several sources: first, by my life-long fascination with animals. 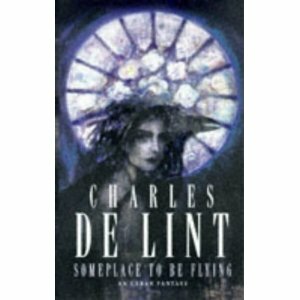 Second, by a wonderful novel that I read some years ago - Someplace To Be Flying by Charles de Lint. This wonderful, and highly recommended story of animal people really awoke in me the idea of animals being in any one of three states in my stories, and moving fluidly between those states. Such Therianthropes or shapeshifters form the heart of my poems. 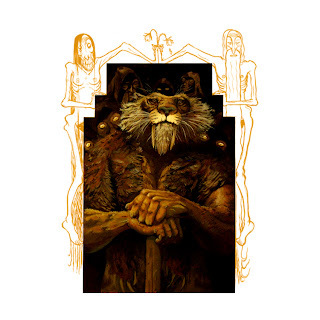 Often, the characters are mainly envisaged as humanoid-bodied and beast-headed in my works, as they are often armed with weapons, and/or are engaged in activities that require hands. It all depends though. One of my major characters, the sly Jack of Foxes, is, in my mind, usually in his fully-fox form. So, I've got the poem, and I've got the character. Let's take Nimravus Lord Daggercat as an example. He's a character that I've had in my head and on paper for quite some time. He's the main protagonist in a long, dark, (as yet unpublished on the blog) tale entitled 'The Burden', and he's also the subject of a pantoum that we published on the blog earlier this year. With hammer struck from shatter'd stone. He comes 'midst blood and splinter'd bone. Elder lord of long and lost. His soul is black, and wrung with doom. Emerging from a whisper'd gloom. Golden eyes red-rimmed and raw. Sabre fangs be-webbed with gore. So I send the poem to Russ for an initial read and the collaboration begins. No idea is too precious. This rather unsentimental motto begins and ends many of our conversations concerning the development of the world described in Phil's Annals. Its my belief that this succinct little phrase is responsible for much of the success (maybe not monetary, but certainly creatively) of our collaboration. No idea keeps all ideas on their toes. No setting can settle, no character find complacency, no detail definite. This is the overlapping theme of our collaboration. Its authority extends beyond our own ideas and dictates even those concreted in cultural and historic tradition (if Santa were in the Annals he wouldn't wear a red suit, or a green suit. Santa might not even have a beard or a wobbly belly, and he definitely doesn't drink Coke). A lot falls to the proverbial cutting-room floor. We strive for originality, something that no one has ever seen before yet find vaguely familiar. First things first, the poem has to be written (or semi-composed with at least a bit of narrative direction). Phil already has loads and loads of material, and since his poems are largely contained in the same universe, many of the characters occur time and time again. This makes the process easier as we go along. As one character is defined visually, the amount of time given to exploratory sketching and discussion for each subsequent poem is often shortened and shaved (although I doubt there will ever be a time when Phil doesn't throw in something or someone new into a poem). This is one of the most challenging, but exciting steps of the process. For me it's reading his original material, and then immersing myself in research. I typically look at all sorts of things. But for this project, I am more and more drawn to the paintings, drawings and design of the late 19th/early 20th Centuries. I've been looking at Mucha, Klimt, Schiele (my favorite), Waterhouse, Alma-Tadema, Gerome and Kollwitz to name just a few. Even though the poems are often dark, often gritty and nearly always grim there is an undeniable sense of beauty and romance. I think romance is dark, or at least our traditionally western notions of beauty (e.g. the Iliad, Romeo & Juliet, Tristan & Iseult, Edward and Bella (or so I'm told)) are mixed with tragedy and death. Not to wax too lyrical, but the sunset will always be more romantic than the sunrise, at least to me, because its light is the last of the day, that pale and dying fire. So, once I've got about half a dozen books or so in front of me, I start sketching out ideas. I try to keep these pretty loose unless Phil and I have had lengthy and detailed conversations regarding some of the more concrete visuals. Then, I scan a whole bunch of stuff in to the PC and send them off to Phil for his take. Then, its emails, redraws (sometimes quite drastic) and onto layouts. Before we nail too many things down, Phil and I try to get together and talk about the poems. We discuss which passages would be best supported by illustration and confirm details (like in the case of Hrafna, "Does she have two swords, one sword, no sword?"). Then, it's all down to painting or drawing. I might still make small changes, and Phil might email me about slight changes to the text, but after that, it's just execution. 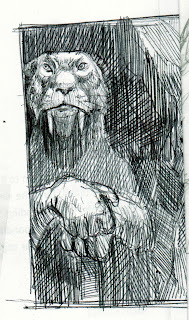 A quick sketch made with a biro pen. 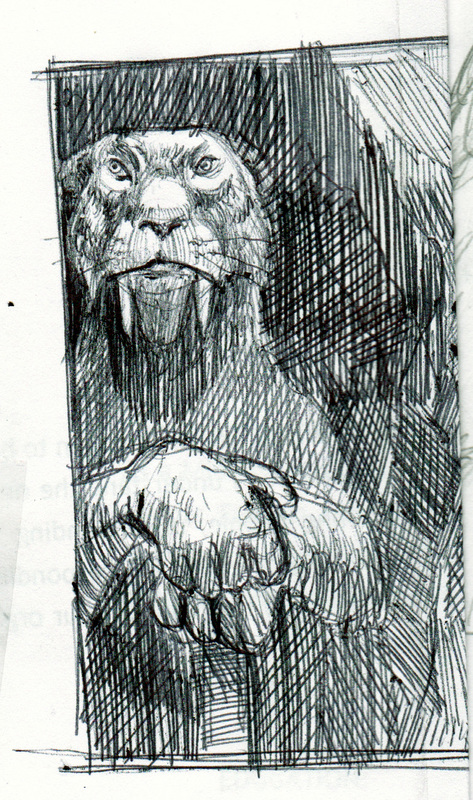 A much leaner, more smilodon version of ol' Nimmy. A composite of two sketches. The border idea came out of nowhere, but I really wanted to include it. Notice how he's still a bit too lean. His hands are also very much like the paws of big cats. Here he is, much bulkier. His hands are more human. I've also added some spooky crones in the background. This was an idea I had (completely out of line with the text) and shared with Phil. He liked it, so we kept them in and Phil even changed the text to add them in ("emerging from a whisper'd gloom"). I think they add an extra level of creepy to the whole image. Like a cat unhinged. Well, here it is nearing the end of August at Old Moon Tower. We're sitting here admiring the sunshine (and the hum of morning traffic) and talking about things to come. Varou is well underway with at least (we think) four more parts to come, lots of new characters to introduce and one mother of a battle scene to wade into. And once Varou has left centre stage there are many many more warm bodies to take his place. We're also investigating different formats, and would love your feedback on where and how you would like to see more of the Annals (think Kindle/Android/iPad, or even more traditional formats...). We can't wait to share more with you, and hope that you'll join us for the journey. Ta ta for now TAoOMers! I hope you see my comment back here in August. Im catching up as I was internet-less over Summer. I clicked on your link to Schiele. Reading about his wife's death, his death 3 days later, and looking at the picture he created of them both in those 3 days, really enhanced what you say about romance and tragedy. I found that picture beautiful and moving. You will reach school age kids most effectively by going down the apps route on android/tablets I reckon. I think this is your lead market. Thanks, Nell. You're right about that image. It is haunting. I think Schiele's life and work embodied the end of Imperial-Romantic Europe after the First World War. It's tragic, but fitting that he died before the advent of modernity. And thanks for the advice about the apps. Time to get down with the tech.